Interstate 73 was identified as a high priority route from Michigan to South Carolina in the Intermodal Surface Transportation Equity Act (ISTEA) that the US Congress passed in 1991. 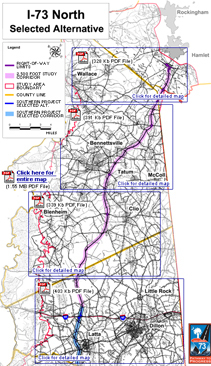 This Website provides information regarding the portion of Interstate 73 for which environmental studies have been completed by the South Carolina Department of Transportation. The study area for I-73 in South Carolina followed the Great Pee Dee River to US 378 west of Conway, traveled along US 378 to US 501 and followed US 501 to the coast. It then proceeded up the coast to the North Carolina state line and then ran along the state line to the northwest corner of Scotland County, North Carolina. It extended along the Scotland and Rockingham County line to the northern side of I-74 in Rockingham County, then west along US 1 to the floodplain of the Great Pee Dee River. This study area was divided into two projects. 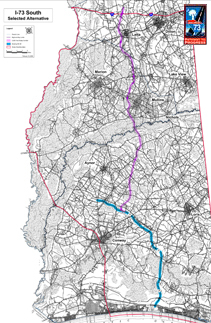 The Northern Project ties to Interstate 73/74 in the Rockingham/Hamlet, North Carolina region and runs south across the South Carolina/North Carolina state line through Marlboro and Dillon Counties to a connection at Interstate 95. The Southern Project continues from Interstate 95 and runs to State Route 22 (Conway Bypass, or Veteran's Highway) in the Myrtle Beach/Conway area. The Northern and Southern Projects are shown in the maps to the right. A Clean Water Act Section 401/404 permit application for impacts from the I-73 project on wetlands, streams, and other jurisdictional waters, was submitted to the U.S. Army Corps of Engineers (USACE) and the South Carolina Department of Health and Environmental Control (SCDHEC) on January 4, 2011. SCDOT is working with the USACE and SCDHEC to process this major permit application, which includes potential construction impacts and a plan for providing mitigation for the unavoidable wetland and stream impacts associated with I-73. The permit application was issued for a 30-day public review period on January 26, 2011. SCDOT has conducted several coordination meetings with the USACE and SCDHEC to address public and agency comments that were received as a result of the public notice. Agency review of the permit application is ongoing, as is SCDOT coordination with these agencies. Final design for the section of I-73 from I-95 to US Route 501 began in July 2011. This design includes 10 bridges, as well as drainage, geotechnical, maintenance of traffic and traffic control, signage, pavement marking, erosion control and utility plans. Other services included in the contract are final surveys, utility coordination, railroad coordination and construction support. Anticipated completion of the final construction plans is in mid April 2012. Depending on available funding and the receipt of the Clean Water Act Section 401/404 permit, construction could begin by the end of 2012. This will be the first section of I-73 to be designed and constructed in South Carolina, and will ultimately provide a vital link between I-95 and the Grand Strand/Myrtle Beach area. 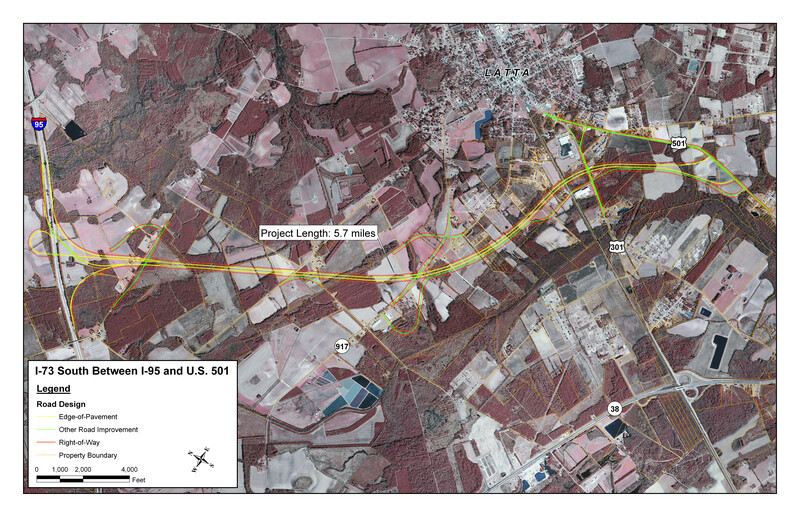 The (right-of-way) ROW plans for the I-73 South project between I-95 and S.C. Route 22 were completed in September of 2009. These plans incorporate design features, such as detailed drainage design. This allows SCDOT to more precisely identify the properties and portions of properties that will need to be obtained to build I-73, as funding becomes available. Property strip maps, showing the right-of-way to be obtained, are available on this website. Several parcels that were to be taken entirely have already been purchased for the right of way for I-73 South. SCDOT is focusing on acquiring rights of way between S-17-38 (Centerville Road) on the north side of I-95, to the Dillon/Marion county line, south of I-95. Right of way acquisitions for this area began during the Summer of 2010 and should be completed in early 2012. This section is planned to be the first phase constructed. Figure: I-73 South between I-95 and U.S. 501. Additional information regarding both the Northern Project and the Southern Project is available on their respective Pages. Southern Project (58kb PDF file) - Published on August 9, 2004. The Project Team periodically makes Project Newsletters available to the public through this Website. These newsletters are intended to inform the public about the progress of the environmental studies, as well as to educate the public about specific aspects of the project.